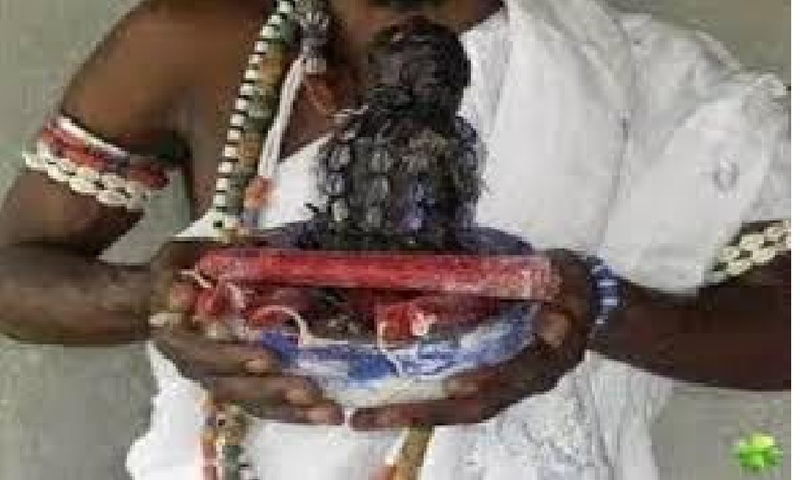 Prior to moving to Bakau as a boy, I only used to hear about Marabouts when adults talk about them, but never seen one; and if I did, I don’t remember. I am sure Marabouts used to come to Banjul, but I do not have a vivid memory of actually encountering one. We used to see the “Sasaboros” and run away because we were told that they kidnap people, especially kids, but I don’t think they are considered Marabouts. They were just hustling by selling some “boro”. After moving to Bakau, there was a man who lived on our street in Conteh Kunda. His name was Janneh and he lived in the one room house at the junction by the pompeh mbeda. His house was part of Conteh Kunda, but built outside of the their fence at the junction. I am not sure how that worked, but the house was part of their compound nonetheless. The house was also located under the Taba tree (guyi taba bi). I believe Janneh was a renter there and would sometimes go back to sen dayka for a few months at a time. I never knew fu sen dayka neyka, and not sure why I never asked. Janneh was probably in his late 50s or early 60s, small in stature, walked with a limp, and had a good temperament. He was always chewing kola nuts and smiling, and his smile was soft and inviting. Almost every evening, Janneh and his friends could be found brewing attaya in front of his doorstep, engrossed in conversation and occasionally snapping out of it to exchange pleasantries with passers-by (alli bay nyadee, sue mole lay?). Evenings in Bakau were always pleasant with a light touch of breeze softer than a feather, and Janneh and his friends always seized the opportunity to bask in it and sip their attaya. Not quite sure how and when, but I found out that Janneh was considered to be a Marabout and said to have a Ginay. It was also said that Ginay bi lived si guyi Taba bi. Being that my unfettered curiosity has always haunted me, I soon befriended Janneh and was lightning his furrno for him sometimes for his attaya sessions (di opa opa yu tanga nak beh afferr bi yanja). I would also pass by occasionally just to say hello. I was intrigued by the Ginay thing for some reason, but didn’t know how to approach it. I remember we once had a challenge game against Wa Police Line and I went to Janneh purr mu sanni nyu some nyan. Whether it worked or not, I had a good game that day, di dagasseh rek! ️ . Moving to Bakau also introduced me to robi pecha (hunting birds ?) with a slingshot. We used to make them using inner tubes from bicycle tires, and they came in red and black rubber. The red one was the preferred one because it was a better quality – the rubber was more refined and gave you a better stretch. We used to call it “engine”. Of course, it was more expensive, but well worth it. My friendships with Janneh quickly grew and I became more comfortable asking him questions and making requests. I had asked Janneh to teach me a verse to recite when hunting petah (bedifin) with my slingshot so I can hit my target because I was getting tired of missing. Here is the verse Janneh gave me “watakulun gebaru, seeran.” Dumakor fateh muk! I still don’t know what it means though. But hey, it was something to hang on to. I was soon reciting it while pulling my slingshot after memorizing it. I would pull to the max and recite, but once I release my slingshot, I would hit a branch instead and the petah would fly away. Not good! So I went back to Janneh to tell him that the verse he gave me wasn’t working. That’s when he told me that I had to recite the verse seven times first before releasing my slingshot. So I tried that a few times too, but by the time I am done reciting “watakulun gebaru, seeran” seven times, the petah would have sensed that danger was lurking and fly away. Smh. I don’t even know if I ever brought down a petah with “watakulun”, fateh na sah! But I was not done with Janneh yet! I walked into his house one evening and started a conversation about his Ginay. I have heard of Ginays before, many times sah – Ginay bu gorr, Ginay bu gegain, Ginay bu amm kawarr bu gudaa guda, ak Jinay bu refetta refet! In that conversation, Janneh showed me a patch of sand in the corner of the house across from his bed and said that’s where his Ginay stands when he visits him. Apparently, the Jinay lived si guyi Taba bi just like rumor had it. Sitting there and listening to Janneh tell me the story of his Ginay, I was attentive and feeling tensed, but I was not afraid. As a ten-year-old boy, I was trying to make sense out of my environment and my daily interactions. My brain was still developing and my belief system was beginning to form, so I had to feed my curiosity. Life is all about trying to make sense of our surroundings as we journey through. May Janneh’s soul Rest In Peace.